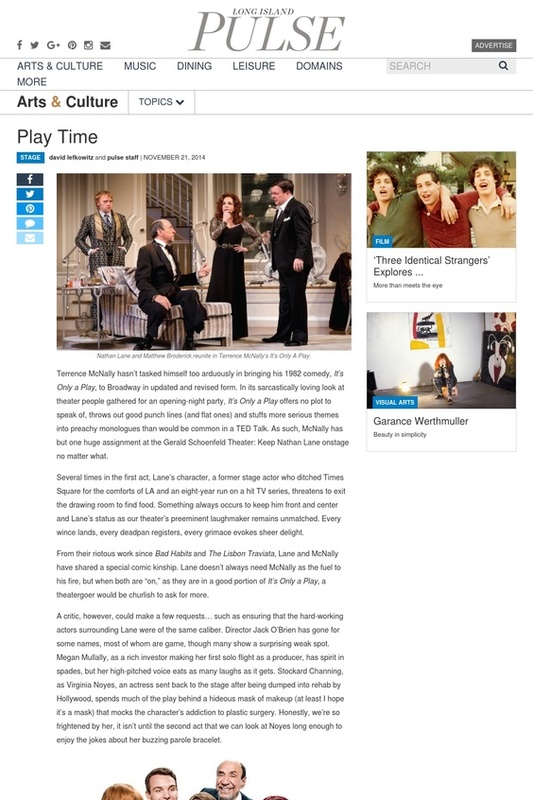 Terrence McNally hasn’t tasked himself too arduously in bringing his 1982 comedy, It’s Only a Play, to Broadway in updated and revised form. In its sarcastically loving look at theater people gathered for an opening-night party, It’s Only a Play offers no plot to speak of, throws out good punch lines (and flat ones) and stuffs more serious themes into preachy monologues than would be common in a TED Talk. As such, McNally has but one huge assignment at the Gerald Schoenfeld Theater: Keep Nathan Lane onstage no matter what. Several times in the first act, Lane’s character, a former stage actor who ditched Times Square for the comforts of LA and an eight-year run on a hit TV series, threatens to exit the drawing room to find food. Something always occurs to keep him front and center and Lane’s status as our theater’s preeminent laughmaker remains unmatched. Every wince lands, every deadpan registers, every grimace evokes sheer delight. From their riotous work since Bad Habits and The Lisbon Traviata, Lane and McNally have shared a special comic kinship. Lane doesn’t always need McNally as the fuel to his fire, but when both are “on,” as they are in a good portion of It’s Only a Play, a theatergoer would be churlish to ask for more. A critic, however, could make a few requests… such as ensuring that the hard-working actors surrounding Lane were of the same caliber. Director Jack O’Brien has gone for some names, most of whom are game, though many show a surprising weak spot. Megan Mullally, as a rich investor making her first solo flight as a producer, has spirit in spades, but her high-pitched voice eats as many laughs as it gets. Stockard Channing, as Virginia Noyes, an actress sent back to the stage after being dumped into rehab by Hollywood, spends much of the play behind a hideous mask of makeup (at least I hope it’s a mask) that mocks the character’s addiction to plastic surgery. Honestly, we’re so frightened by her, it isn’t until the second act that we can look at Noyes long enough to enjoy the jokes about her buzzing parole bracelet. On the sturdiest ground alongside Lane are F. Murray Abraham as a vituperative critic with a braying laugh and a hidden agenda, and Matthew Broderick as the author of their play. Broderick and Lane together again? Yes. And the magic is still there. Broderick’s underplaying can be tiring elsewhere, but it adds lovely balance here and he makes the aforementioned speeches about the value of theater gently heartfelt—good medicine on this stage. For aficionados who love and follow theater trends It’s Only a Play is a no-brainer. It’s full of not-so-mean nudges about everyone from Bernadette Peters to Daniel Radcliffe and about every show from The Lion King to Bradley Cooper in The Elephant Man. (The latter is literally playing next door, so, naturally, Lane shouts his punch line in that direction.) And so, we’re back to Nathan Lane again. True, it’s only a play, but our leading man is oh so much more. David Lefkowitz founded TotalTheater.com, co-publishes Performing Arts Insider and hosts the Dave’s Gone By radio program (davesgoneby.com). He hopes his latest play, The Miracle of Long Johns, will be coming to a theater near you.